This is the lovely domed cover from a muffin dish. It has discoloured around the rim and the moulded knop shows a few signs of wear. A lovely dish with beautiful domed cover and ornate loop handle. Backstamp: Rd No 623294 This Pattern was introduced by William Adams in 1780 being a copy of a Chinese pattern and one of the first of its style produced in English pottery Wm Adams England. The base has light crazing with a small manufacturing chip under the rim which has been glazed. It also has some wear to the foot although inside it shines like new! The cover has a little minor wear under the rim otherwise excellent condition. E J D Bodley of Burslem. bone china with gilt rim. A most unusual dish with the brown leaf like transfer set on moulded relief with a pretty floral pattern to the rim of the cover. The finial on the cover set on a pink circle. Lovely dish with domed cover. 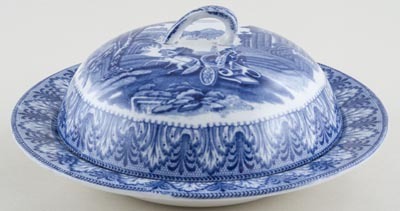 The cover and inside of the dish are decorated with rural scenes and grapevine and wheat borders printed in a steely blue. Backstamp: British Scenery Booths Silicon China England and impressed Booths. Light all over crazing with some light discolouration although this is mainly underneath the base and to the cover there is a tiny blemish in the glaze. Lovely dish with moulded detail to the rim and pretty flower finial to the domed cover. Backstamp: Booths Made in England Peony A8021. Excellent condition. With gilt. Backstamp: Booths Silicon China Made in England Real Old Willow, impressed Booths and date for January 1928. Base has some wear to the gilt, light crazing and small under rim chip which has resulted in a short hairline. The cover with its ornate handle and embossed decoration is fine. Provenance: The Entwistle Collection. With gilt. Lovely domed lid from a muffin dish. No backstamp. A little very minor wear to the gilt otherwise excellent condition. With gilt. Backstamp: Booths Silicon China Made in England Real Old Willow. Date of manufacture probably 1924. A small muffin dish. The gilt is worn on the base and the cover has light crazing otherwise excellent condition. Provenance: The Entwistle Collection. With gilt. Lovely round dish with domed cover and embossed decoration around the loop handle. Backstamp: Booths Silicon China Made in England, impressed Booths and date for 1925. Light crazing and the cover has one or two very minor blemishes, overall excellent condition. A lovely elegant dish with blue and gilt scroll design. Bone china with gilt. A fabulous floral sheet pattern with birds and butterflies. Backstamp: Impressed Brownfield and date for 1881 and inside cover printed registration mark. A little minor wear to the gilt otherwise excellent condition. A really unusual dish with a Japanese feel to it. The decoration of lotus flowers is set against a stippled background, with a mock bamboo handle. The base shows some signs of age with some discolouration and a small rim chip. Originally introduced about 1913 as Chinese Peacock, this design is known today as Bluebird. This small muffin dish was made in the early days of this pattern. A little minor discolouration around the inner rim otherwise lovely. Blue printed backstamp B&L. Burleigh Ware, Burslem, England. With gilt. This is a gorgeous dish with fabulous gilt spatter decoration around the flowers. Backstamp: Claremont Burleigh Ware B & L England Rd No 524539 and pattern number 3817 in script on the cover. The gilt on the rims is worn and there is some general wear to the inner rim of the base and a little brown mottling underneath. Overall though extremely pretty. Burleigh with gilt. Lovely dish with moulded side handles and domed cover. Backstamp: Burleigh Ware Willow Burslem England. There is some wear to the gilt on the base and the cover has light crazing. Overall excellent condition. With gilt. Absolutely lovely small muffin dish. Backstamp: Burleigh Ware Willow Burslem England. There is a little wear to the gilt and just one or two lines of crazing to the cover otherwise excellent condition. Lovely dish with loop handle to the domed cover. Backstamp: Cauldon England. To the base there is some surface scratching and wear and also underneath some minor manufacturing faults. The cover has a little discolouration under the rim. Small blot of ink inside to the base. With gilt. Round dish with wavy rim and lovely finial highlighted with gilt to the domed cover. Backstamp: Royal Cauldon England Est 1774 Made in England. Excellent condition. With gilt. Backstamp: Cauldon England Est 1774. The gilt is almost totally worn on the base and to the handle on the cover, otherwise excellent condition. This is an absolutely gorgeous flow blue bone china dish. There is a tiny tiny nick to the foot rim otherwise superb. Bone china with gilt. This is such a pretty dish in an all over floral pattern. The domed cover has a pretty finial highlighted with gilt. Backstamp: Cauldon England. Excellent condition. With gilt. An extremely pretty muffin dish with ornate finial to the domed cover. Backstamp: Royal Cauldon Made in England Victoria. Excellent condition. Bone china with gilt. Fabulous dish with domed cover. Backstamp: Belfort Coalport England AD 1750 Leadless Glaze. A little minor wear to the gilt and to the tip of the finial and the occasional very minor blemish, overall excellent condition. Plain cream muffin dish - lovely classic look. Bone China with gilt. Delightful dish with domed cover and flower finial. Backstamp: Crown Staffordshire Est 1801 Fine Bone China England Rd No 630163 and in script F12713. Excellent condition. Bone china dish with gilt rim and basket weave pattern to rim of base and around rim of cover. This is actually a marriage - but a good one! Plain white although the base is slightly creamier than the cover. The cover has a gold rim and lovely gold finial. The base is marked Crown Staffordshire. With gilt. Very pretty muffin dish with lovely flower finial to the cover. Backstamp: Impressed Monogram for J Dimmock and date for 1881 and printed F Primavese & Sons Cardiff Ironstone (the latter being the retailer). The gilt is worn and it is crazed with discolouration but this is mainly inside and underneath the base, so that when the cover is in situ' it looks pretty good. S Fielding & Co, Crown Devon, of Stoke on Trent. A most decorative piece with gilt finial to cover and gilt rim both showing some signs of wear. Light crazing to both cover and base. Brown printed backstamp, including Reg. No. 554725 for 1910. Bone china with gilt. A fabulous muffin dish with ornate finial to the cover and the pattern printed in a rich cobalt blue. Backstamp: Printed and impressed G & Co W and in script 2 1903. Excellent condition. Light crazing to both cover and base. There is moulded relief decoration to the cover and rim of the base. This dish is crazed but a most attractive dish. Very attractive eagle pattern dish with ochre rim. Backstamp: Aquillia H H & G Ltd England Rd No 718718 and impressed date for 1926 This was made by Woods for the retailers Hales Hancock and Godwin. The cover has a few lines of crazing otherwise excellent condition. Bone china with gilt rim. Lovely floral decoration to cover and inside base. With gilt. Lovely domed cover from the muffin dish with ornated embossed design around the base of the loop handle. No backstamp. This lovely lid has a very small chip to the rim and is crazed otherwise excellent condition. Domed cover only from a muffin dish. No backstamp. A little minor wear to the rim, otherwise excellent condition. Small muffin dish with an unusual handle on the cover. There is some restoration to the base (visible in photograph) and it has a little minor surface scratching inside otherwise fine. the domed cover is in excellent condition. Blue printed George Jones & sons Abbey 1790 England and impressed crescent mark and date for 1925. James Kent. A most unusual piece in Olde Foley. The round base has decorative beading around the wavy rim and lovely scene to the centre. The domed cover has two lovely rural scenes either side of the sunken knop and beaded decoration around the crown. The base has light crazing, the cover is in superb condition. Lovely dish with ornate finial to the domed cover. Backstamp: Masons's Patent Ironstone China Regency England C4475 Rd No 821349 in Gt Britain Guaranteed Permanent & Acid Resisting Colours. Excellent condition. Round dish with domed cover which has loop handle. Backstamp: Masons Patent Ironstone China Regency England C4475 Rd No 821349 in Gt Britain. Crazed with a little minor discolouration. Provenance: The Pool Collection. Bone china with gilt rims. Lovely ornate loop handle to domed cover and beautiful decoration to both the base and cover. The loop handle has been off and carefully restuck. Imprssed date cypher for 1923. With gilt. Lovely dish with domed cover and ornate handle. Backstamp: Impressed Mintons, 5 and date cypher for 1880. Excellent condition. Very pretty muffin dish, blue printed under the glaze with hand applied enamel colour. Excellent condition. Blue printed and impressed Mintons with impressed date cypher for 1916. Lovely plain white swirl fluted cover and rim to base. Gold finial. Cream dish with orange rims. Lovely bright floral decoration to cover. Crazing to base. Bone china with gilt. This is a lovely muffin dish in superb condition. Backstamp Pointons England. Bone china with gilt. Fabulous dish with loop handle to the domed cover printed in a mandarin blue. Backstamp: Pointon's Stoke on Trent England. A little minor wear under the rim of the cover otherwise excellent condition. Gilt rim dish on cream ground. Very pretty wavy fluted rim to base and swirl fluted decoration to cover. Lovely floral decoartion to cover. Absolutely gorgeous bone china muffin dish with gilt rim. Delicate embossed decoration to rim of base. Small glazing fault to inside rim of dish, not noticeable when cover in situ'. Printed & Impressed DERBY marks and impressed date for July 1911. Cream body with flowers hand painted in pretty pastel colours. Impressed date for January 1938. Fabulous octagonal dish with domed cover. Backstamp: Royal Doulton Made in England Norfolk Rd Nos 251612 & 597783. The base has light crazing and there is a tiny tiny nick to the inner rim of the cover overall excellent condition. Bone china with gilt rim. Romantic scene either side of the domed cover and inside the base. Backstamp: Royal Doulton England and impressed date for 1906. A little very minor discolouration inside to the base and a little minor wear under the rim of the cover, overall excellent condition. Bone china with gilt. A fabulous muffin dish with ornate finial to the cover and the pattern printed in a mandarin blue. Backstamp: Royal Worcester England. Bone china with gilt. Backstamp Royal Worcester Made in England. Royal Worcester. Bone China with gilt. This is an absolute delight! A charming oriental scene, surrounded by a glorious floral border. A little minor wear to the gilt otherwise in superb condition. Has printed date code for 1918 and pattern number W7634.